R-Voice :: Home / News & Blogs / Happy new academic year! I hope that you had a great Summer. I was lucky enough to spend a bit of time in Greece. It was beautiful and very hot. Before I went off on my holiday, I saw lots of you at the Fun Day. 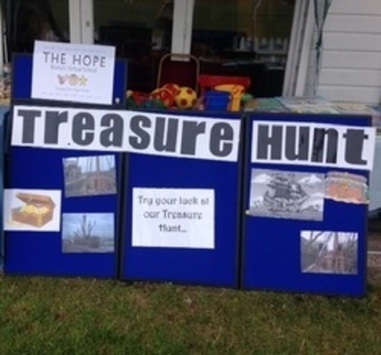 It was great to see so many of you doing The HOPE’s treasure hunt and getting a lovely prize after your hard work searching out letters and finding the word that all the letters made. I wanted to say thank you to all The HOPE staff who worked hard making that such a good day, especially Chloe, our Business Support Assistant, who spent a long time getting everything ready and setting up the stall. So, now it’s back to school, college or work. This will be a very exciting time at The HOPE as we now have a full staff team! Our new starters this term are Anne Mortimore, Early Years Support Teacher; Hattie Billsberry, Secondary Education Advocate, and Penny Russell, 14-19 Education Advocate. Also, Adam Glover, who was working for The HOPE during the Summer terms last year has now joined us permanently as our Primary Education Advocate. We hope that lots of you will meet our new staff, as well as those who were already in post last year, as we go through this school year. Wishing you all a very happy term.